Our drive west towards Big Bend was, for lack of better word, awesome. After spending two months driving through the populous, billlboard-riddled eastern half of the United States, driving down I-10 and seeing nothing but craggy mountains and rugged plains for 80 miles at a time was unreal. So much nothingness. But it was exciting; we finally made it to the west! 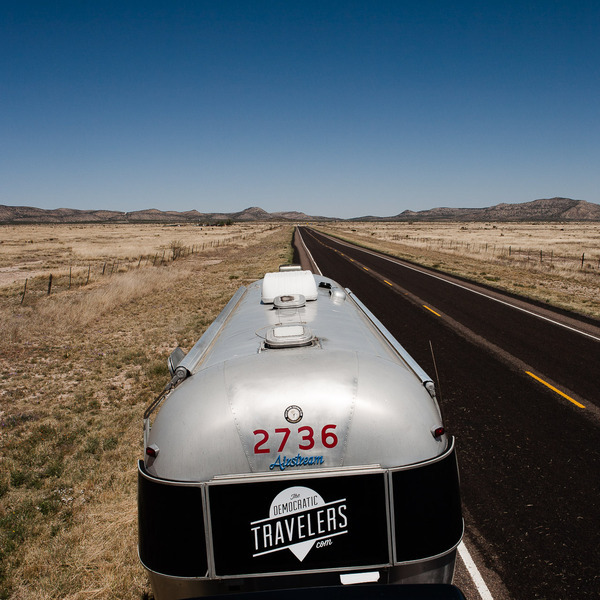 After a long drive through empty state highways, the smallest towns, and miles of desert, we arrived at our base camp, the Stillwell Store. Just seven miles from the northeastern entrance of Big Bend National Park, the Stillwell Store offers gas (all out when we got there), groceries (and expensive beer), RV hookups (we had the whole place to ourselves) and the Hallie Stillwell Hall of Fame Museum (a tough-as-nails woman who helped settle West Texas). The drive took twice as long because we kept pulling over to snap pictures. This is when John discovered his affinity for climbing on top of the truck to get great photos. We were all ready to spend the day soaking in the hot springs overlooking the Rio Grande and hiking through the mountains of Big Bend…until we found out that the National Park Service is VERY anti-dog. Dogs aren't allowed on any trails in most national parks, they basically can only go where cars can: roads and campgrounds. Awesome. We didn't want to leave poor Bulleit alone in a hot trailer all day, so we scrapped our hiking plans and spent our few days at the Stillwell Store taking advantage of the solitude and fast WIFI. 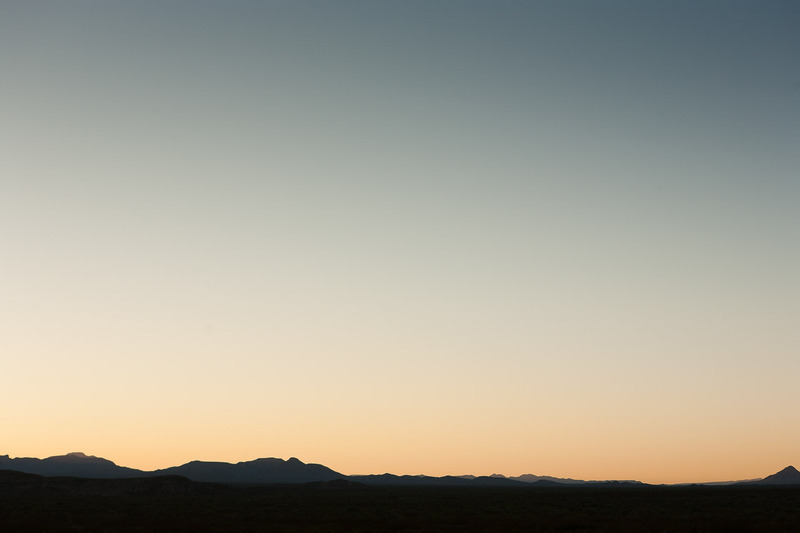 We had beautiful vast sunsets every night in the deserts of West Texas. All hope was not lost however, we discovered that Big Bend Ranch State Park, east of the National Park, had a few dog-friendly hiking trails and vistas that rivaled the national park. 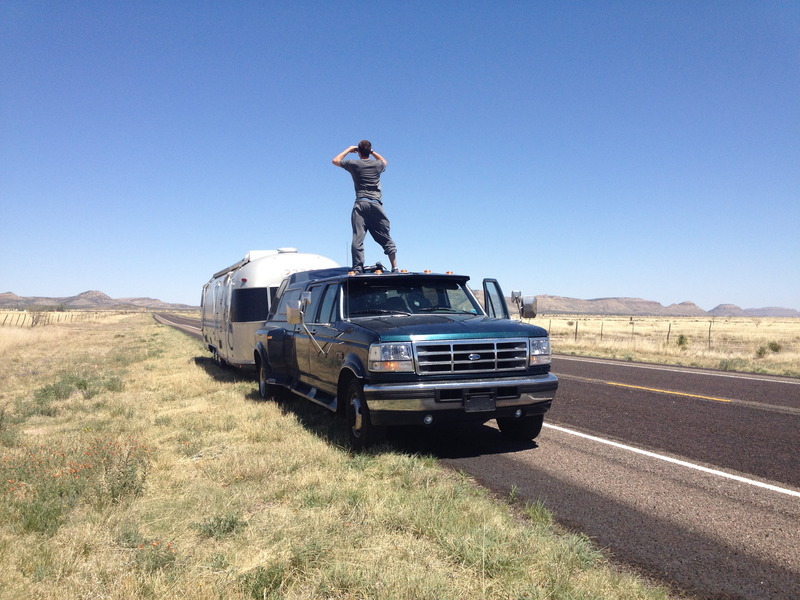 So we packed up Loretta and embarked upon a scenic drive through Big Bend National Park. 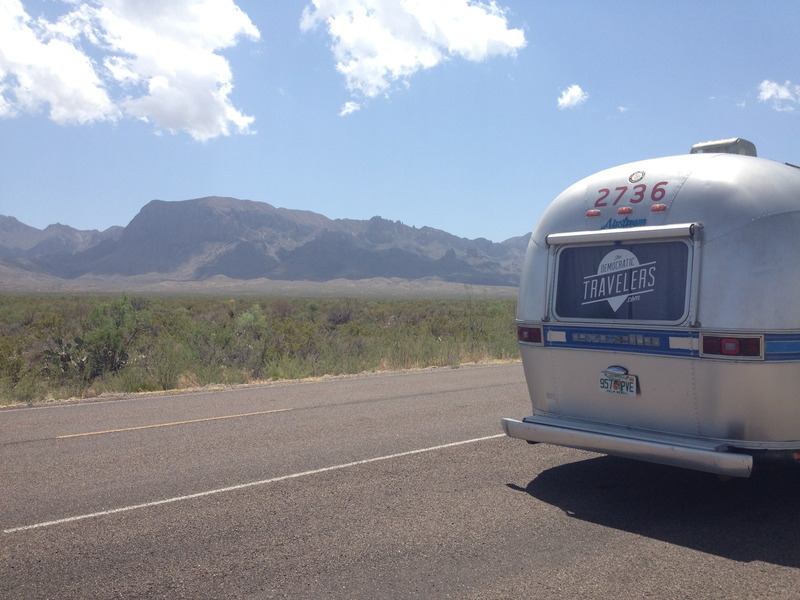 Loretta lookin' real good against the Chisos Mountains of Big Bend. As one of the most remote and least visited national parks in the country (we're talking like 300,000 per year, compared to the Grand Canyon, which gets five million annually), it certainly is breathtaking. 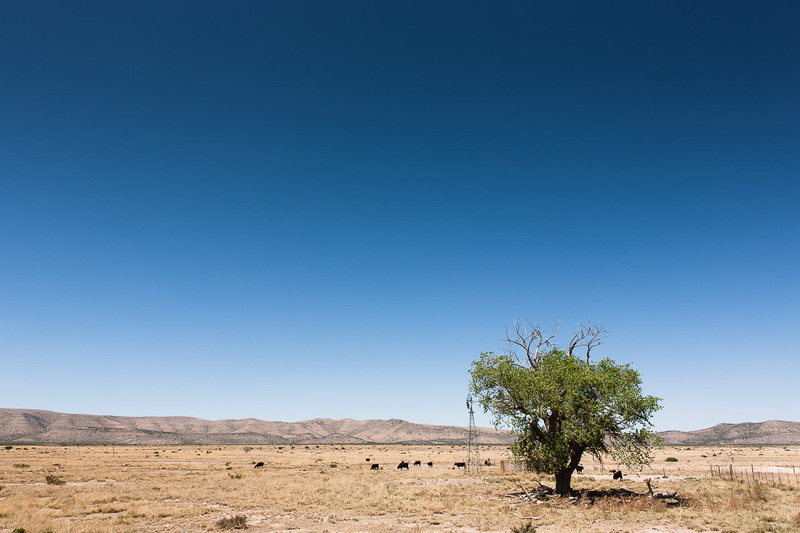 The vast desert covered with cacti, spindly ocotillo with scarlet flowers, and rain-starved shrubbery is seemingly endless until you reach the dramatic Chisos Mountain Range. You can't take your eyes off the Chisos; every mile you drive, the light changes and they look completely different and even more beautiful. We kept pulling over to take pictures, but they don't quite capture what it was like to actually be there. 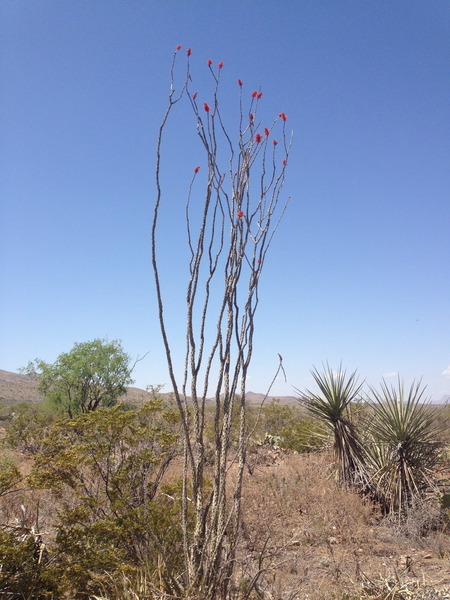 Ocotillo aka Desert Coral aka my new favorite desert plant. They were everywhere and some were over ten feet tall! 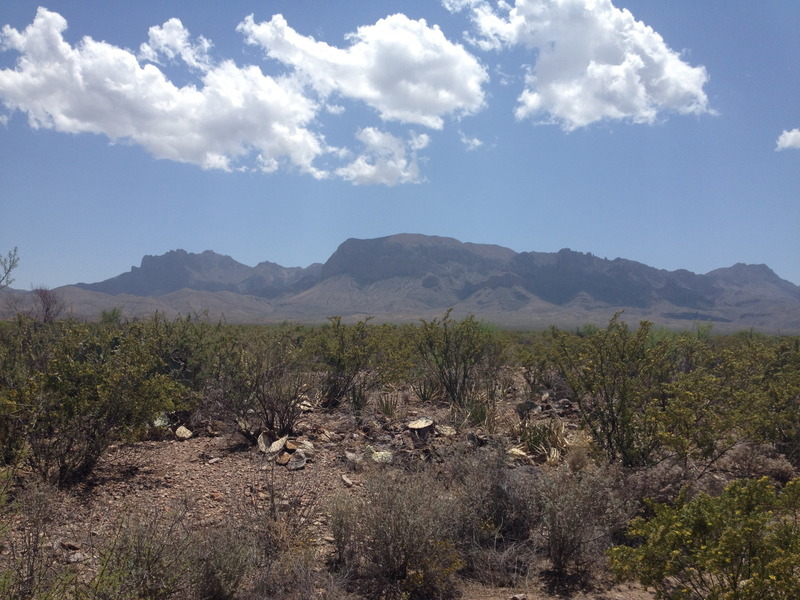 There was so much to explore at Big Bend that we logistically weren't able to, which is a shame. But we were about to spend a few days at the next best thing (and turned out to be even better); Big Bend Ranch State Park. Special thanks to Ty L. (who suggested Hike, camp, gaze at the stars.) for making this blog post possible!